Raccoon Info: Raccoons are easy to recognize with their distinctive black mask and ringed tail. The are very common in Orlando, particularly in more urban areas. They are well adapted for survival in cities. They are excellent climbers, and they have very nimble hands. They are also strong, and they often explore, tearing new areas open in search of food and shelter. They like to den in trees, but they love to den in attics. A mother raccoon is very protective of its litter of 3-5 young, usually born in the spring time. Like many mammals, they are primarily nocturnal, though some people spot them during the day, often when in search of food. They are omnivores, and will eat almost anything they can get those crafty hands on. The raccoons in Florida are smaller than average, but I've caught them up to 20 pounds here. My most popular how-to page appears to be my how to get rid of raccoons page, of tips & techniques for raccoon removal. Nuisance concerns: Raccoons are probably the most commonly dealt with nuisance animal in Florida and much of the USA. They have adapted to living with humans. They have learned that garbage cans and dumpsters are excellent sources of food, and that houses are excellent habitat. A mother raccoon will often tear a hole in a roof to access an attic, where they will make quite a mess and a lot of noise. They can cause significant damage in an attic, both by contamination from their waste or by structural damage to insulation, beams, or even by chewing on wires. They will search hard for food, and are fond of tipping over trash cans, raiding dumpsters, and stealing pet food. They will often break into a screened-in porch to get pet food. If there's food or shelter to be had, raccoons will break into your house. At times, they'll crawl under houses and up the walls, and oftentimes there are baby raccoons are in the walls the ceiling. They carry a number of parasites and diseases that can affect people or pets. They are the #1 carrier of rabies, a potentially fatal disease. They also carry canine distemper, which can kill your dog. Their feces may contain raccoon roundworm, the spores of which humans can breath in and become seriously infected by, so it is important to capture raccoons using human habitat. 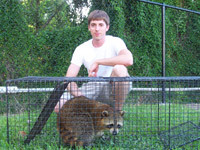 Raccoon removal and control is our specialty. There are so many raccoons in FL that it's no wonder! 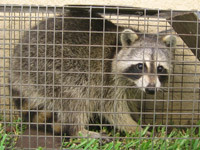 An Orlando raccoon in a Havahart trap. I removed these juveniles from an attic. Removing little raccoons inside an attic. One of my first Florida raccoon catches. 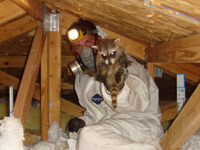 Remove raccoons in a house - This page shows a wooden gable vent that a raccoon ripped open, and a roof trapping to remove the raccoon from the house. Remove raccoons in a wall - photos of a raccoon entry in the wall of a house, the removal of baby raccoons from inside the wall, and setting them as bait to catch the mother raccoon. Raccoons in a dumpster - photos of raccoons in a dumpster, and then after they've been trapped. Baby raccoons in the wall - An interesting job showing the removal of baby raccoons from both the walls and ceiling of a house, and the capture of the adult female. Raccoons chewing on wires - do raccoons chew on electrical wires? Yes! Trap a raccoon on the roof - a job with a roof trap set to catch a raccoon exiting a roof dormer. How to Get Raccoons Out of the Attic - a job showing the snaring of an adult raccoon to bring it out of an attic. Raccoon nest in the attic - one of my first jobs, when I had to cut a nest of baby raccoons out of a ceiling. Raccoon attic contamination - photos of poop and damage in an attic from a raccoon. How to get raccoons out of the ceiling - photos and tactics for the removal of raccoons from the ceiling. 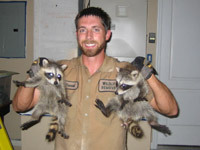 Get rid of baby raccoons in the attic - photos of a job outlining the removal of baby raccoons in an attic. Raccoon feces photos - photos of raccoon poop and disease information. How to prevent a raccoon problem (or mitigate a current one) - When raccoons start to become a pest animal, it is often when they are invading garbage cans and creating trouble out in the yard. If this behavior is not reined in immediately, the raccoons will become frequent visitors and will eventually look to your home for a place to sleep and raise young. To lessen the likelihood that a raccoon is going to be a houseguest, make sure that garbage cans are secure or stored in an area where the bandits cannot get to them. Many people don�t realize it, but raccoons are fond of pet food. Leaving your dog or cat food out on the porch is a huge setback in the war against nuisance animals. When you look at your property, anything that might be eaten by a raccoon needs to be picked up and placed in a sealed container. It�s often not enough that the animal can�t see it; if the food is still giving off an aroma the raccoons will be tempted to get to it. Of all the nuisance animals, raccoons are the most ingenious when it comes to opening containers. The next step for getting rid of raccoons has to do with home repair. You need to make sure there are no exterior openings for raccoons to enter the house through. Pay close attention to large vents, like roof or gable vents. Vinyl soffits and dormer corners are a favorite point of entry into the attic. If you have a raccoon living in the building, you need to have it trapped and removed. 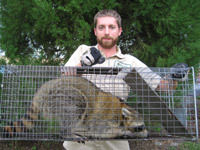 Due to the aggressive nature of these animals when cornered and their likelihood of carrying rabies, most states require professionals to handle a raccoon. The Raccoon is the largest mammal in the procyonid family and ranges from eight to twenty pounds in weight. It is easily recognized by its distinctive �bandit-like mask� and paws that resemble hands and fingers. It is even speculated that the dark hairs that make up the �mask� may aid them in night vision by blocking out lights. They have a greyish coat that is covered with down hairs, or ground hairs, which work to insulate them against weather conditions. Raccoons are usually nocturnal, although they are seen during daylight hours as well. They are omnivorous, meaning they eat both plant and animals. Raccoon Raccoons are intelligent and have been recorded as remembering solutions to problems for up to three years. They usually prefer land; however, they are decent swimmers and can stay in the water for several hours. Although they usually walk on all four legs, they will stand on their hind legs to reach with their hands for foods and to remove obstacles in their path. Raccoons like trees and are the only procynoid � that is so large - to go down trees head first by rotating their back paws for better grip. Thought to be colorblind, raccoons use their sense of touch for everything. Their claws tell them what they are grasping before their eye sight can register it. Raccoons love vegetation and therefore choose their homes around bushes and trees where they have easier access to foods. They also like to be around humans because of the easy food sources available to them. They are mostly common in North America, but introduction into other areas has them making their homes across Europe as well. Raccoons like to live around trees and other structures so that they can climb up and away from predators or when they feel threatened. Raccoons usually mate between January and the middle of March. Male raccoons roam the areas looking for females. Females may mate with one or more males depending upon the males and the season. Female gestation period averages about 65 days and their litters of �kits� range from two to five babies. The kits are born both deaf and blind. The males do not take part in raising the young and usually take off to find other places to live while the mother raises her young in the den. After about twenty weeks, the kits are able to see and hear. The kits begin exploring outside their den and begin eating solid foods for the first time while their mother weans them from her milk. In the fall the kits have become juveniles and begin splitting up to find and create their own dens. Raccoons live, on average, about two or three years in the wild; however, they can and do live much longer in captivity, sometimes up to twenty years. Rabies is perhaps one of the most serious of diseases that raccoons carry. Rabies can be deadly and it isn�t always apparent that an animal has the disease. Raccoons also carry distemper, which does not affect humans but can affect family pets. Some of the diseases they carry that can affect humans are Leptospirosis, which causes jaundice and other liver problems; listeriosis, which is rare and usually present in infants and the elderly, causes upset stomach and other problems and in rare cases can lead to meningitis; tetanus, also known as lockjaw and tularemia, a very serious and contagious infection. As more and more habitats for raccoons are being taken up by urban expansion and making more room for humans, raccoons are forced to find other places to make their homes and find their food. Urban areas are excellent places for raccoons as there is an almost unlimited supply of food sources for them. Aside from diseases that raccoons carry, they can be very destructive to property and vegetation. Raccoons will eat most anything and oftentimes feed off of pet food that�s been left out, left overs and trash in the garbage cans and other food sources. They dump over trash cans causing huge messes and potential for spreading diseases and they can tear up walls and attics as they make human homes into their own. Their strong, sharp claws and hands have no difficulty ripping off lose wood and other materials to get inside attics. Learn more about raccoons through my educational articles. Find out if raccoons live in trees or sleep in trees, and whether or not they swim or come out in the rain. Pet owners will want to know if raccoons attack cats, dogs, or other pets, and a common question I get is whether or not raccoons in fact do use tools. Are raccoons dangerous to cats, dogs, or other pets? Do raccoons eat or travel in packs? Can raccoons open doors or windows? Can raccoons jump onto houses or over fences? Do raccoons burrow or dig holes? Do raccoons eat mice / rats?